To place an order just send me an e-mail. My e-mail address is below. Ohio residents please add 7% sale's tax to your total order. Need something cute for the Easter basket. Check out the little chicks. They are just so cute. I had fun making them. Price for one of these chicks is 2.50 and doesn't include poastage. Only 5 left in stock now. Looking for a little Easter decor? 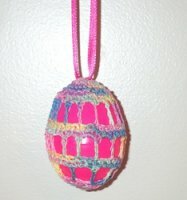 Here is some plastic easter eggs coverd with thread. I also have some of these that has a rabbit hiden inside and you can see it. I will have a picture of it as soon as I can. Price for one of these is 2.25 and doesn't include postage. 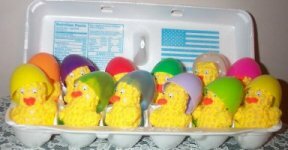 These here are egg cover's. These would be great for Easter. Price is $3.50 each but doesn't include postage. I will have more to come soon.